Enter the desert in search of the key to save humanity—the Great Power. Quinn Bravesford, for the sake of her kingdom, leads her soldiers into battle against a swath of enemy nations. One year, the king declared that he would send a large-scale investigation team to the Desert of Beginnings. And so, Quinn was selected to captain this mission. Quinn gazes at the ancient alchemic device, the Lunagear, within her hand. According to the legends of yore, once the Lunagear is equipped with the four Orbs, it will unlock the Great Power that will save humanity. Only one Orb resides in Quinn’s Lunagear. Collecting the four Orbs for the Lunagear, however, is a mere legend. With the threat of dangerous creatures and Machine Dolls wandering the desert, one of the enemy nations, the Principality of Neuhaven, has dispatched their military in search of the Great Power. Now, Quinn and her band of allies must fight against the Principality of Neuhaven in hopes to find the Great Power and save humanity. Quinn steels herself, but even so, she can’t help but doubt the existence of the Great Power. 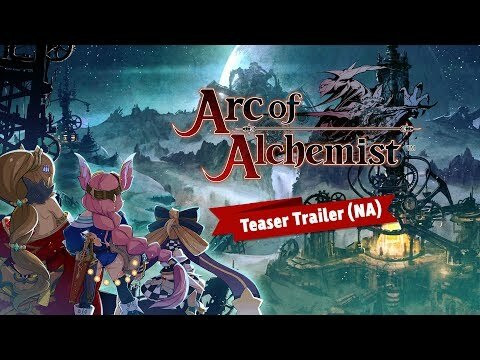 The upcoming Arc of Alchemist PS4 release date is Q3 2019 in the US and the UK. Notify me when Arc of Alchemist PS4 is available.